Silk wedding flowers provide a great alternative to fresh flowers. Brides choose to use silk flowers for various reasons whether its because they are getting married abroad or they want to keep them as a memento of their wedding day. There are now more and more quality silk flowers in the shops to buy whether it’s via the internet or on the high street the quality has certainly improved over the last few years. It is sometimes really hard to tell the difference between the silk and the fresh. 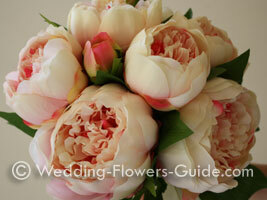 I created the bridal bouquet below with artificial peonies - and some of my colleagues thought they were real! It’s worth paying for quality, I definitely think less is more when it comes to silk. If you haven’t got a huge budget just concentrate on the key artificial wedding flowers like the bouquets and buttonholes. Top quality silk flowers are definitely worth paying a little bit extra for if you can. Some people will choose to make their own silk wedding flowers if they are creative or generally enjoy craft activities. Other people enlist family members to give them a hand, as it’s a perfect activity to enjoy with a close relative like a mum or sister. However if you’re not that creative or the prospect scares you then don’t worry; plenty of suppliers sell the finished article. Online you will be able to find various suppliers who will make all your artificial wedding flowers from bouquets, buttonholes and centerpieces. Some suppliers provide a bespoke service where you can design your own unique silk wedding flowers. I always recommend that you should start with the bridal bouquet and bridesmaid’s flowers as you begin to plan your wedding flowers. 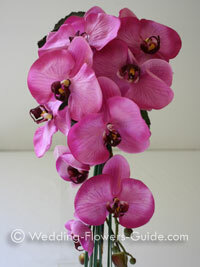 The picture on the left is of a phalaenopsis orchid shower bouquet that I created with silk flowers. Your focal point might be the color theme for your day, a fashionable style like the recent vintage theme or your love of a particular flower. For instance, I know from years of experience that one of the most popular wedding flowers is the calla lily. This can provide you with a great starting point when looking for your fake wedding flowers. See our page on silk bridal bouquets for more information on styles and choices of wedding bouquets. When buying or designing your silk wedding centerpieces, you just need to think carefully about the design of them. The most successful artificial centrepieces are those with a minimal but stunning flower design. 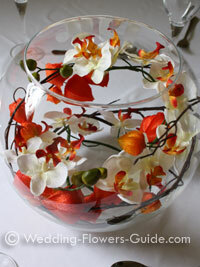 For instance here you can see a large goldfish bowl with twisted silk orchids and 'chinese lanterns'. This would look stunning for a Fall wedding theme. Likewise a tall slim vase with a stylish display of silk gerberas, beargrass and fake folded aspidistra leaves can look really effective. Personally I think this style of centerpiece works better than a mass of mixed silk flowers, that can look slightly dated or fussy. It will also allow you to spend more on the individual flowers achieving a better quality, as you wont have to buy so many. To achieve that beautiful coordinated look on your photographs, it’s important for the men to have boutonnieres (buttonholes). You need to make sure that you use the same supplier for both the bouquets and buttonholes, as it’s essential that they all coordinate. This alone makes them look equally as good as fresh flowers. I recommend choosing silk flowers for the buttonholes that are as near perfect to the actual size of real flowers. 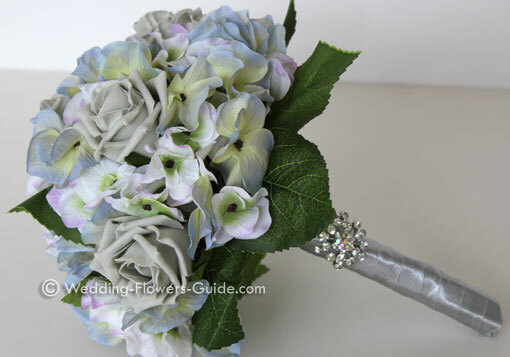 Overly large fake buttonhole flowers can look too artificial or fussy. Keep them stylish, simple and as smart as possible. You might also want to ask any of the ladies in the close wedding party like the mums if they would like a corsage. Silk wedding corsages make a perfect keepsake. You’ll need to allow yourself plenty of time when planning and purchasing your silk wedding flowers. Not only will it take you time to choose or make your perfect flowers it may also take your supplier time to produce everything. But the great thing about using artificial flowers is that you can buy them well in advance.